From all of us at Howl2GO Midwest, Happy New Year! Thank you to all our clients for an amazing 2018 and we’re thrilled to be back on the road in January. December was a terrific month for us, and we’re excited for the new year. We are performing a great mix of events including some stunning weddings, high energy corporate events, and even some January Holiday Parties! At our double-header out in Kansas on January 4th, we’re playing a huge fundraising event at KSU, alongside a corporate event. At the same time, the curtain raises up in Streamwood at the wedding of Mark and Kimberly. On Saturday 5th, we head back to Chicago and right to the top of the AON building for the second wedding of the weekend where Hannah and Mike will be embarking on a new life together. What better setting than the stunning Mid-America club for a fabulous celebration? Simultaneously, we’ll be taking the stage at Harrah’s Casino in Joliet for United Piping‘s Annual Holiday Bash. 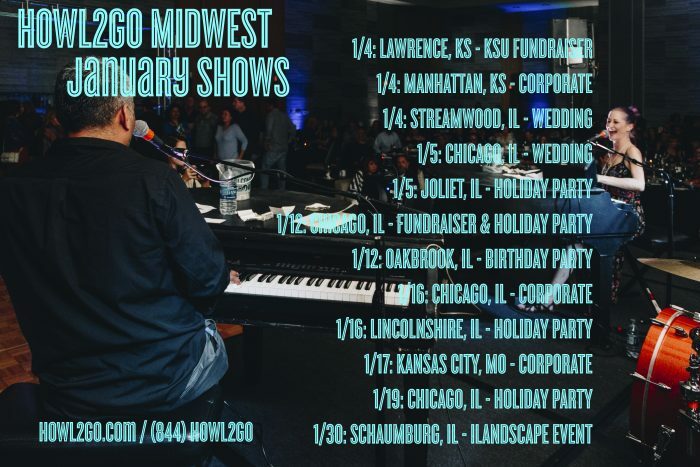 The following week, we’ll be Dueling out at a Holiday Party at Le Meridien in Oak Brook, fundraising for St John Fisher School, and even playing a birthday party in Chicago. There is no greater compliment than being asked back by a party for a repeat performance, and we think our friends at Grainger hold the record! For the last five years, we have joined them for their annual holiday party. This year at the Viper Alley in Lincolnshire. Jordan and Nick will be hitting the stage on January 17th in Kansas City, where an event for White Commerical will be in full swing. Heading back up to the Windy City, our full Dueling Piano band will be onstage at one of our favorite venues, The House Of Blues. Another repeat client of ours will round off the month here at Howl2GO Midwest. We’ll be braving the cold out to Schaumburg for our return to the iLandscape event at the Renaissance Schaumburg Convention Center.